Popovers, in my mind, are the perfect bread. Crusty on the outside, soft on the inside, and fun to look at. Add cheese, and they're even better. I just made my standard old popover recipe, but sprinkled cubes of Manchego cheese and a pinch of sea salt on them before popping them in the oven. Preheat the oven to 425. Spray a popover pan with Pam. Mix the flour, milk, eggs, and butter in a bowl. 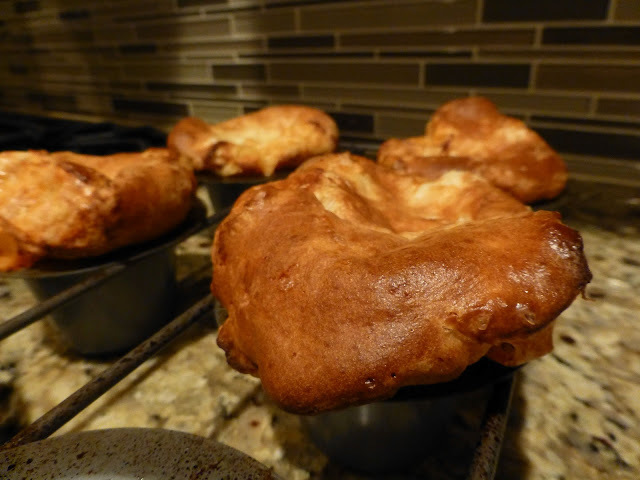 Pour the batter into 6 popover cups. Sprinkle a pinch of sea salt and 4 cubes of Manchego cheese on top of each one. Bake for about 30 minutes (check around 25).